64% of job seekers say that a poor candidate experience would make them less likely to purchase goods and services from that employer. 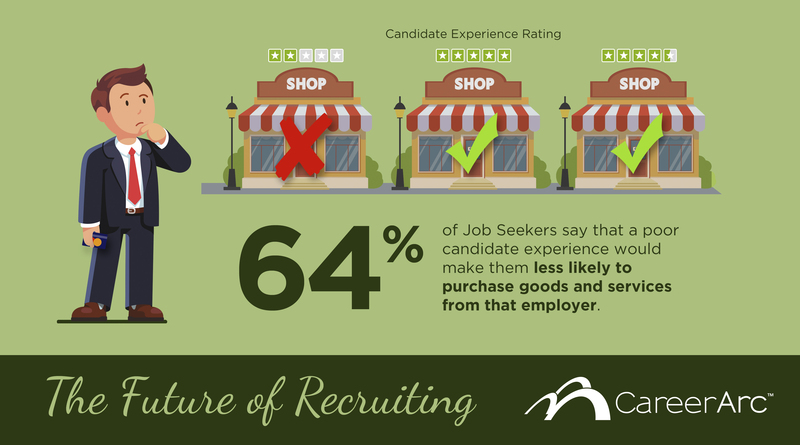 We surveyed over 1050 professionals about the current state and future of recruiting and found that job candidates—who are also consumers—are making decisions way before they submit an application or return to a place of business. The infographic below illustrates what happens before and after the job application, as well as the risks and opportunities these findings pose to employers who compete for top talent. Candidate Experience is impacting consumer behavior. Moreover, while 91% of Employers agree that candidate experience can impact consumer purchasing decisions, 3 out of 4 Employers do not measure this potential loss in revenue. Only 1 out of 3 Job Seekers report having been asked by an employer for their feedback as a candidate. Online Reviews are indeed influencing candidate behavior. 55% of Job Seekers who have read a negative review have decided against applying for a position at that company. 1 in 3 Job Seekers reported having shared at least one negative review of a previous or prospective employer. Candidates trust employees most, and CEO’s, least. Job Seekers rank current employees as the most trusted source for information about a company, followed by online reviews from job applicants and former employees as the second and third most trusted sources, respectively. Least trusted by Job Seekers are CEO’s and other executives, ranked lower than Recruiters and Recent News Coverage about the company. Social Media is now the Most Popular Recruiting Platform among Employers AND Job Seekers. Job seekers rank social and professional networks as the most useful job search resource compared to job boards, job ads, employee referrals, recruiting agencies, and recruiting events. 91% of Employers are using social media to hire talent today. Social Media and Social Recruiting Software is the No. #1 planned technology investment of 2017. Employers believe that Social Media Marketing will be the most in-demand HR skill by 2020, followed by Data Analysis and Predictive Modeling. Candidate Experience is the No. #1 Priority in Hiring. 97% of Employers plan to invest in employer branding efforts in 2017. The majority (51%) plan to increase their employer branding investment. 99% of Employers believe managing your employer brand and reputation is important to attracting top talent. 95% of Employers believe employer brand protection will become more important in the next 5 years. However, only 45% of Employers devote HR resources to protecting employer brand. 63% of Employers expect hiring volume to increase in 2017 compared to 2016. Employers are slightly disconnected on the 2020 Technology Roadmap. Job Seekers want to see more Virtual Reality and Job Matching Technology in the job search, while Employers plan to integrate more Gamification in their recruitment process. Job Seekers reported being exposed to skills testing and assessments in their candidate experience more than any other recruiting technology, but it is also the technology they would least like to see the in the future. When Job Seekers were asked which part of the standard job search process needed dramatic improvement,69% believe the Response Time to Applicants awaiting a hiring decision can be most improved, desired even more than enhancements to the Online Application Process. Workplace Flexibility continues to top the list of desired employee perks. 71% of Job Seekers rank Workplace Flexibility as the top benefit that would most attract or retain them as employees, followed by Health & Wellness Perks (58%) and Professional Development / Course Fee Reimbursements (48%). Most overlooked brand risk? Long-term joblessness. The long-term jobless (unemployed for 27 weeks or more) were 2.5x more likely to share negative employer reviews on social media than the short-term unemployed. Nearly 70% of unemployed Job Seekers who were provided outplacement–an employer-sponsored career benefit that helps the recently unemployed land their next job faster–said it improved their relationship and/or perception of their previous employer. 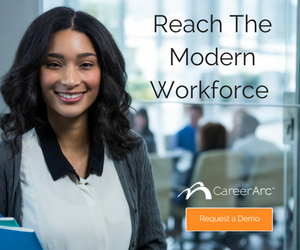 The results of the Future of Recruiting Study, conducted in partnership with research firm Future Workplace, were collected through a survey of 616 HR professionals and 438 job seekers between February 2 – 14, 2017. 64% of job seekers say that a poor candidate experience would make them less likely to purchase goods and services from that employer. View the infographic.